Superb craftsmanship combines with stunning beauty and color to create an inspirational finial that will enrich any tree it adorns. The angelic beauty tree topper Christmas ornament is exquisitely painted by hand and accented with quality glitter that sparkles like the snow in sunlight. This is one of our finials & tree toppers personalized individually by the artist to produce a decoration that is one of a kind. 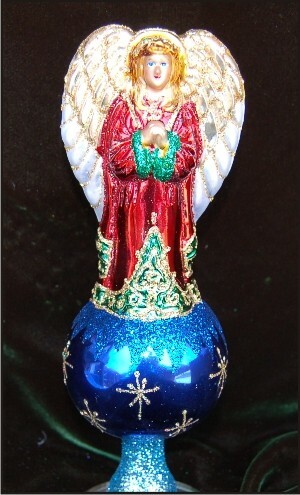 You'll top your tree with rare splendor when you select the beautiful angel glass finial ornament, and it's a lovely gift for anyone on your list.